In the main shrine hall, behind the Karmapa’s brocade-covered chair is an elegant folding screen, with scrolling leafy branches and luxurious flowers in muted golds, greens, and subtle orange playing over a resonant black background. Between the screen and the Karmapa is an altar holding statues of Marpa and Milarepa on the right and left with Gampopa in the middle. His text, the Ornament of Precious Liberation, is the focus of the discussions. A butter lamp is lit before him, its light illuminating the gold in the statues and highlighting the screen behind. Set wide to the right and left are two screens, which display quotations from the monks’ reports and the charts they have made to unpack the text and make relationships clear. This has been the setting for the study of the Ornament of Precious Liberation, Lord Gampopa’s stages on the path (lam rim), which appears to be the only text of this kind in the Kagyu tradition. Seven sessions of papers and discussion covered chapter nine through chapter sixteen with their respective topics of the proper adoption of bodhichitta, the precepts for generating aspiring bodhichitta, and under the rubric of engaged bodhichitta, the five perfections of generosity, moral discipline, patience, diligence, and meditative concentration. During two evenings, discussions took place on additional topics: Is it proper for the ordained Sangha to eat meat? Is it proper for tantric practitioners to drink alcohol? During these five days the Karmapa often came to be present for the papers and discussions that followed. He responded to questions, pointed out problems, told stories from his own experience to illustrate a point, and also made sure that people on the outside of the inner circle of khenpos and teachers were able to ask questions. One day during a tea break, he brought his cup and came to sit on a cushion next to the khenpos, and engaged them in a discussion that transformed into a lively debate with quick repartee and a traditional slapping of hands as other monks gathered around to listen. Khenpo Karten from Rumtek Monastery’s monastic college was at the mike skillfully guiding the general discussions, summarizing question and answers, and making his own comments. For over five months at the Karmapa’s temporary residence (Gyuto Tantric University), he had guided the monks from nine different Karma Kamtsang monastic colleges while they studied and researched their papers. They learned to source quotes and compare the originals with those in the Ornament of Precious Liberation and to bring in citations from other texts to support or refute a point made in the text. In this way, they amplified their traditional training in reasoning. The goal of these seminars is to create an extensive commentary on the Ornament of Precious Liberation by combining the best of eastern and western scholarship. During the session on generosity, to encourage reflection, the Karmapa posed questions to the monks about this perfection, which often revolved around a discussion of what makes for a good teacher since the highest form of generosity is the gift of Dharma. Does the giver need to be free of seeing what is being given as truly existent? If the generosity of bestowing Dharma is the highest gift, does the teacher need to be free of all afflictions? Does the student need to have gathered all causes and conditions the texts mention? The Karmapa noted the necessity of the motivation to benefit others and the need to teach what accords with their interests and appeals to their minds. To this end, a teacher should know the customs and way of thinking in the country where they are giving instruction. What is more important, he queried, to give the Dharma or simply to benefit people? A bodhisattva gives whatever benefits, not just the Dharma, he remarked. One contemporary question the Karmapa had been considering is whether or not it is possible to give an empowerment via the web. The following day the focus of a long discussion related to moral discipline was the interrelationship of the pratimoksha vows (the vows of individual liberation) and the bodhisattva vows. The Karmapa mentioned three traditions, one that requires the pratimoksha vows, one that doesn’t and one that requires both. The Karmapa remarked that in the understanding of the Kadampa tradition, the essence of the pratimoksha vows is not to harm others, and so they are necessary as a basis for the bodhisattva vows. If this is the case then the question follows, since the pratimoksha vows are just for this lifetime, if we take them and then bodhichitta vows, what happens to these when a person passes away? The next topic was the perfection of patience, which functions as an antidote to hatred. 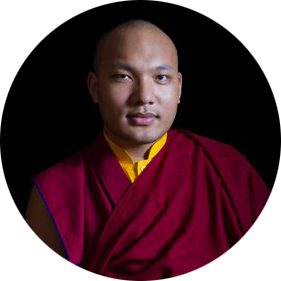 In passing the Karmapa noted that in the Tibetan tradition, the explanation of the vows comes after one has taken them and sometimes people are hesitant because they do not know enough about what they will be accepting. In the Chinese tradition, the explanation comes a week beforehand so one knows what the vows are and what one has to keep. He suggested that it would be good to look into this. The discussion circled around again to the pratimoksha vows as the Karmapa stated that we have to know why they are only held for this lifetime. He answered that since they are considered to be part of the aggregate of form (like our physical body), they will pass away when we lose our body at death. Then the question arises: If this continuity of form is lost, what is it then that goes from this life to the next? How does this relate to having taken bodhisattva vows until we realize full awakening? The last day of the discussions saw an early ceremony for the Sixteen Arhats who are responsible for holding the Dharma teachings. The monks chanted the text from the new chant book and focused at the end on prayers for the Karmapa’s and the lamas’ long life. After a break the monks returned to begin their investigation of the chapter on meditative concentration, the essence of which was described as resting in one-pointed concentration. This allows one to overcome what is not conducive to practice, especially a busy mind. The presenting monk described the three isolations: of body (staying in an isolated place), speech (resting in silence), and mind (being free of conceptualizing or mental constructs). The second presentation focused on how to train our minds and on working with the afflictions, for example ignorance and hatred. The antidote for hatred is meditating on love for those close to us and then gradually expanding this so that our love fills up the whole universe. The remedy for ignorance was meditating on interdependent arising. The core of the discussion was the famous quote from Nagarjuna, stating that whatever is interdependent arising is emptiness and visa versa, which allows us to see that things arise from a cause, which is empty as well. On a more relative level, the discussion turned to the twelve links of interdependent apprising, their individual definitions, and different ways of looking at their relationships and their groupings. After the Karmapa arrived, Khenpo Karten asked the monks to consider if calm abiding meditation (shamatha) is focused on a coarse or subtle consciousness. Then different aspects of practice were brought up. Is there a difference between calm abiding in the foundational vehicle and the mahayana? There were also subtle points. If one rests one-pointedly on the mind, this will make the mind workable but it will not bring authentic meditative concentration. And even to attain authentic calm abiding, we need to develop a mind and body that are workable and this is only possible through calm abiding without a reference point. In the afternoon discussion, these points lead into a long and complex discussion of the four meditative concentrations and their preparatory stages, and also covered how the practice of the exchange for self and other functions. For example, the Ornament of Precious Liberation states that this practice of exchange is for overcoming pride, and a comment was made that the Way of a Bodhisattva teaches that meditating on the views of the transitory collection is the way to overcome pride. The presenting monk showed a painting of the famous stages of meditation, which move from calm abiding through superior insight (vipashyana). These are illustrated by a monk and an elephant. The monk represents the practitioner; the elephant, our mind; the snake on his back, our concepts; the demon leading the elephant, our obscurations; the rope he uses, our hopes, and so forth. The progress of meditation is then shown through the process of the monk coming to ride the elephant. The picture of him in the cave shows that he has attained control over his body and mind. He then comes to ride the elephant that has turned from black to gold in color. Finally the monk rides a rainbow indicating that he has realized emptiness. Khenpo Karten again asked the monks to consider some questions. Is calm abiding meditation necessary for superior insight meditation? In the fourth meditative concentration of the formless realm, is uncontaminated joy present or not? Above the second level of meditative concentration, are there thoughts? A lengthy discussion dealt with which school was the basis for the text. Some said because there are many citations from Nagarjuna in chapter seventeen, it must be the Middle Way. Others commented that since the very first chapter is about buddha nature, it must be the zhentong Middle Way school, which professes the view of buddha nature as being empty of what is other to it. Another looked at the lineage of the Karmapas and said the Third Karmapa Rangjung Dorje followed the zhentong Middle Way view and the Eighth Karmapa, Mikyo Dorje followed the rangtong (empty in and of itself) Middle Way, and so the lineage encompasses both. Khenpo Karten commented that particular to the Kagyu is the view that the bodhisattvas do not take birth in the formless realm because there is no form that would allow them to help living beings. On the other hand, one monk commented that the Kalachakra tradition states that a subtle form remains in the formless realm. The question about calm abiding and superior insight led to an examination of the word for superior insight: lhak thong (mThong) means “to see” and Lhak (lhag) can mean “to be superior” or to see “better” or “deeper.” One monk proposed that authentic lhaktong comes only at the first bodhisattva level when deeper seeing views emptiness itself. Another states that calm abiding plus prajna (wisdom) is lhaktong. A third said that being to meditating on emptiness and lhaktong means the same thing. And a fourth monk recalled that the Seventh Karmapa said lhaktong refers to the clear and knowing aspect of mind. At the end of the discussion, the Karmapa came and capped the study of the Ornament of Precious Liberation with a brilliant discussion of the tantric tradition. Searching history, he traced basic elements of the tradition back to their origins. For example, mantras are related to what were known as “true words” or “words of truth” and we find a reference to them in the Buddha’s very first teaching on the Four Truths. Here he describes words of truth as “words imbued with the true way things are.” He traced the origin of dharani (gzungs) back to the tradition of giving praise to deities. Over time these praises were slowly condensed into dharani or the longer mantras, which are special to the vajrayana. Pure lands are related in the Mind Only school to pure vision coming from the pure part of one’s mind. The first anuttara tantra to appear was known as the Tantra of the Vajra Being, a collection of practices of some fifteen different deities. It is from this text that the vajrayana gets its name. 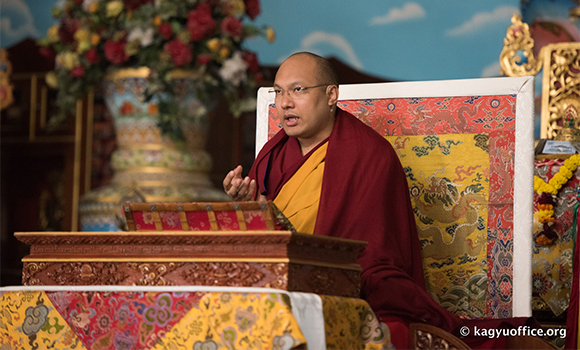 Following this presentation, the Karmapa gave the concluding talk of the Winter Debates in which he thanked Khenpo Karten for his three years of giving teachings during more than five months to the monks who participated in the discussion group for the Ornament of Precious Liberation. He also thanked Khenpo Karten for leading the discussion groups so skillfully. Next year, the Karmapa said, the discussions will be based on the Supreme Continuum by Maitreya because it is very beneficial to mahamudra practice and there are various redactions as well. The Karmapa then thanked the khenpos, tulkus, and the many monks who had come, the staffs of Tergar Monastery and the Kagyu Monlam, all the monks who gave papers, and the twelve monks from Gyuto Monastery who also participated in discussions on the Ornament of Precious Liberation. Dedications and prayers for auspiciousness brought to a close a fruitful and stimulating five days of practice and study.